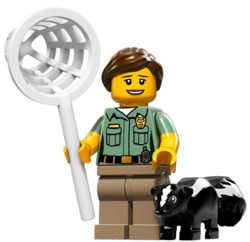 Animal Control is a minifigure that was released in 2016 as a part of 71011 Minifigures Series 15. When there's a bat in your belfry, a rattlesnake in your rafters, or an elephant in your swimming pool, you call the Animal Control specialist. She knows all the best tricks for luring unwanted critter visitors out of their hiding places, capturing them humanely, and then transporting them out into the wild to be safely released.There's one particular skunk, though, that's been giving her a lot of trouble. No matter how many times she removes him, he always seems to find his way right back to the Animal Control office. She's starting to think he might like her. It's almost sweet, but he's a wild animal, and so whenever he makes his fragrant appearance, it's into the net and back to the woods he goes! "Oh no, not old Stinky again!” When there's a bat in your belfry, a rattlesnake in your rafters, or an elephant in your swimming pool, you call the Animal Control specialist. She knows all the best tricks for luring unwanted critter visitors out of their hiding places, capturing them humanely, and then transporting them out into the wild to be safely released.There's one particular skunk, though, that's been giving her a lot of trouble. No matter how many times she removes him, he always seems to find his way right back to the Animal Control office. She's starting to think he might like her. It's almost sweet, but he's a wild animal, and so whenever he makes his fragrant appearance, it's into the net and back to the woods he goes! This page was last edited on 28 August 2016, at 10:38.